Please call us at (434) 293-6069 for further details and to schedule a showing with one of our agents. Zion Crossroads Professional Park, located at 5570 Richmond Road, presents an ideal opportunity for professional office space in a great location! Just minutes away from Zion Crossroads,Zion Crossroads Professional Park makes doing business a great fit for any small to mid-sized company, as well as, law, accounting and other professional firms. Tenants, employees, clients; everyone appreciates convenient travel from Charlottesville and the surrounding area, ample parking and a myriad of nearby amenities at Zion Crossroads. Office suites range from 152 - 1,318 SF. Multiple floors available too (not contiguous). Commercial parcels available for lease or sale in Farmville's most exciting Mixed-Use Development and Community: Sunchase. Sites range from 1 to 3.5 acres. 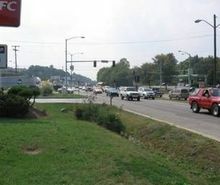 Prime 1 acre +/- commercial parcel available on the busiest thoroughfare in Roanoke, 35K ADT. Adjacent to award-winning residential communities; Hickory Woods and Glade Creek. Ideal site for restaurant, fast-food, car wash, bank, shopping center or other retail. Owner will consider sale, build to suit or land lease options. Sale Price: $450,000/acre. Wexford is a 41-lot planned community in Greene County, VA. This property was developed by Management Services Corporation and is currently being marketed by Caton Properties, Inc. Please visit the community's new website for the exciting details on this project. Airport Road Office Plaza is a 5 +/- acre commercial office development site located 1/3 mile from U.S 29 and the Charlottesville Airport. The Owner has a preliminary site approval and ARB Entrance Corridor COA to build a 60,000 square foot, LEED Certified, Class A, office building. With the Airport, Hollymead Town Center, NGIC and UVA Research Park within a short distance to the property, this makes an excellent investment opportunity for an office building development. Exciting mixed use development in college town seeks new businesses, stores and restaurants to joing nationally recognized tenants in an appealing retail envrionment. bathrooms and more! Great location only 1.5 miles from exit 136 on I64. Convenient to Richmond and Charlottesville. State Farm, Lower Pantops, and Downtown. foyer. Excellent location close to Barracks Road Shopping Center and ByPass. Interior janitorial not included.